The koala, Phascolarctos cinereus, is a tree-dwelling marsupial that lives only in Australia. These herbivores grow to an average height of 2 feet and a weight of 30 pounds, although males tend to be around 50 percent larger than females. 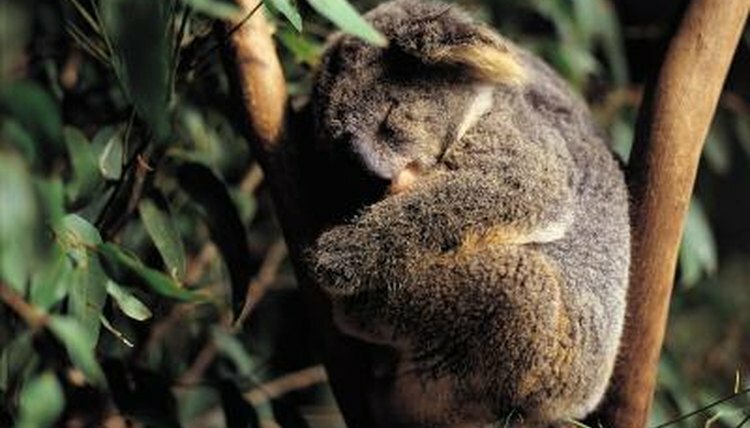 Because the eucalyptus they consume requires significant energy to digest, koalas sleep up to 18 hours a day. They are most active in the evening. Koalas do not make nests; rather, they sleep on branches or in the forks of the branches of the eucalyptus trees in their home ranges. These animals maintain home ranges that may overlap with those of other koalas, but they mainly keep to themselves. A single koala will stay within its own home range its entire life, and avoids the trees marked by other koalas. Koalas are sedentary most of the time, although they are capable of running and climbing quickly if threatened. Adult males are more active during the summer mating season, when they not only mate with available females in adjacent home ranges but also fight with rival males. Baby koalas are born after a month-long gestation period and, like other marsupials, develop in their mother’s pouch. Mothers wean their young after about a year, but young males stay on their mother’s range for another year or two until they reach sexual maturity. While all koalas occupy distinct individual home ranges, the ranges of adult breeding males overlap those of breeding females. Mating and socializing between koalas takes place in shared trees that occupy more than one koala’s home range. Koalas also communicate with each other using loud calls that can be heard for considerable distances. These calls broadcast a koala’s location and its availability for mating. Male koalas also use vocalizations to convey dominance. Fewer than 100,000 koalas live on the Australian mainland and surrounding islands. The greatest threat to their survival on the mainland is habitat destruction, although thousands of koalas are killed each year by motor vehicles and non-native dog predation. Populations introduced to Australian islands have thrived, often at the expense of native flora and fauna; unfortunately, attempts to reintroduce island koalas to the mainland have been largely unsuccessful.